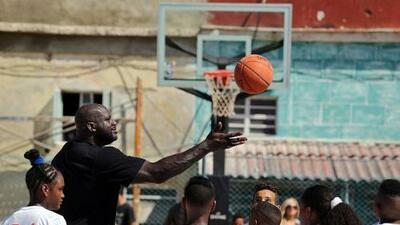 HAVANA (AP) -- The Shaq show came to Havana on Sunday as NBA great Shaquille O'Neal put on a basketball clinic for local youngsters, becoming the latest emissary for American outreach to the people of Cuba. "Baseball, soccer, basketball - it's about sports, you know," O'Neal said. "We share a lot of things in common. We just want to come over here and extend our friendly hand and just start smoothing things out." "It was great for (Obama) to reopen the door, regain a better relationship with this beautiful island," he added. "I would really like to become great, a great player," Navarrete said. "Maybe I can become a great player like Shaquille O'Neal." This March, the Tampa Bay Rays played Cuba's national baseball team in a Havana exhibition game that was attended by both Obama and Castro. O'Neal's goodwill tour of Cuba runs through Tuesday.